Hazrat Sultan Bahu Rahmatu-Allahe Ta-aala Alaihe has sufficiently lengthened the subject of the Ishq in wake of his natural association the Real Ishq. 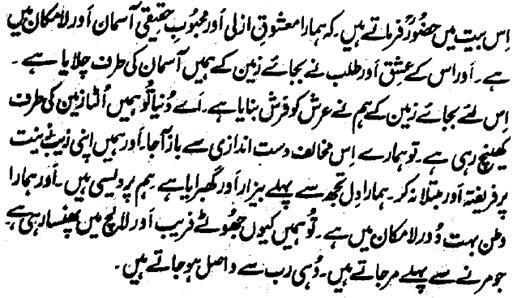 In this stanza, Hazrat Sultan Bahu Rahmatu-Allahe Ta-aala Alaihe says that 'our Mashooq since Azal and the Real beloved is in heavens and Lamakaan and His Ishq and Demand has attracted us upwards to skies instead of earth. Hence, in place of this earthly floor, we have made the Arsh our floor. O Dunya (World)! you are attracting us with an opposing force towards earth. You should stop this unfriendliness and do not try to make us a fan and devotee of your pomp and glitter. Our heart is very much weary and tired for you. We are travelers travelling to other land and our homeland is very far in the Lamakaan. You are captivating us in scheme and avarice. Those, who (virtually) Die-before-Death, they are the ones who can only become Waasil with the Sustainer .